In a bid to encourage healthcare experts and organisations for hatching out innovative solutions to benefit people at large, Andhra Government is set to organise Health Datathon and Health Hackathon in June. Being organised by the Health Medical and Family Welfare Department, Government of Andhra Pradesh, along with Elets Technomedia, the Asia & Middle Easts premier media and technology research organisation, the event will be held in Visakhapatnam from June 18-20. Any company or organisation which has proven records on the front of data science/ analytics/ machine learning or institutions having keen interest to leverage data science to cater people of healthcare sector, can participate in the event. The Government is providing the platform to share innovative ideas on how the existing data set from public health space can be harnessed for cross industry benefits/ purposes. A Health Hackathon will also be organised on the same date. All Start-ups wishing to prove their mettle in medical technology can showcase their innovation at the event. It is also an ideal platform for the students of engineering (mechanical, electrical, electronics, design, biomedical) and working professionals interested in medical technology entrepreneurship opportunities. In Andhra, the government has taken several initiatives such as PPP health schemes in the State is an initiative to look at from the point of view of its prospective advantages. Aarogya Andhra Pradesh is about States vision for achieving a higher rank in happiness index. Measures have been undertaken to improve the overall health standards of the people. Under Aarogya Raksha end-to-end cashless services would be rendered for 1,044 diseases under secondary and tertiary care through 432 government and private hospitals. Another initiative is Aarogya Raksha, under this end-to-end cashless services would be rendered for 1,044 diseases under secondary and tertiary care through 432 government and private hospitals. 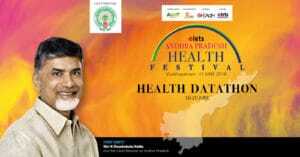 Visakhapatnam Health Festival — will be one of its kind. Health initiatives in Andhra “ Considering the requirements in changing scenario, the Health initiatives in Andhra have been planned considering challenges in near future in terms of public healthcare. Aarogya Andhra Pradesh “ is about States vision for achieving a higher rank in happiness index. Measures have been undertaken to improve the overall health standards of the people. World No Tobacco Day: How smoking affects your health?